Today Papua New Guinea is at a turning point. On the one hand we can choose to start afresh with new leadership, new vision and new hope for the future. Or we can continue down an uncertain, slippery road, led by a person who is increasingly behaving like a dictator, with total disregard for the law. As former Prime Ministers we have made our choice, and we ask our fellow Papua New Guineans to join us in rescuing our country. We cannot, through inaction, see our democracy and the institutions that support democracy ruined. The nation’s future is at stake. Today we are declaring that the Prime Minister must stand down, for the good of all Papua New Guineans. Mr O’Neill has brought the nation to its knees – socially, economically and politically – and he cannot be allowed to do more damage. His countless lies to trick the public that our country is sailing along smoothly are a deceitful display of moral corruption. The fact is we are trapped, and sinking. We have decided to speak out and urge all Members of Parliament to support a change of leadership and commence a national rescue effort. Mr O’Neill should ensure there is a smooth and rapid handover of the Prime Ministership by recalling Parliament immediately and resigning, so that Parliament can elect a new Prime Minister. This is the only way to end the division and chaos that Mr O’Neill has fostered, and to bring an end to the violence, bloodshed and discord that have resulted from his leadership. Mr O’Neill has demonstrated he has no capacity or intention to restore national unity, or to lay a strong and fair foundation for sustainable growth of the country. Only a new Prime Minister with a new approach can do that, which is why we are supporting change of leadership. Both of us are committed to assist where we can in the difficult but necessary task that lies ahead. The past five years of Mr O’Neill’s leadership have been characterized by mismanagement, waste and corruption on an unprecedented scale. Papua New Guinea under Mr O’Neill is trapped in a circle of financial and economic woes. The answer is not more borrowings, which is what Mr O’Neill has chosen. More unconditional borrowings are just band aids on a tropical ulcer; more borrowings will just tighten the trap. The country’s social fabric is being torn apart. Institutions of state, including the judiciary, the Bank of Papua New Guinea and the police, are being politicized, attacked and incapacitated. Mr O’Neill has perverted the Constitution and Laws of Papua New Guinea. The Public Service and state enterprises have been used as Mr O’Neill’s personal belongings, to be ordered about with complete disregard for processes, propriety and accountability. The systems and processes of government have been undermined and willfully bypassed, with the result that the machinery of state barely works. The Public Service has been paralysed by a lack of operational funding. Students are being shot at and treated like criminals, universities are closed, the police and defence forces are fractured, and social and economic conditions in rural and urban areas are deteriorating. 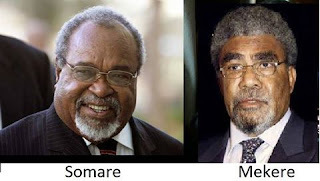 The rights of ordinary Papua New Guineans enshrined in the Constitution have been trampled on – in particular the right to free speech and the right of assembly for legitimate purposes. The media has been subject to threats and intimidation – and, on occasion, actual physical violence. Mr O’Neill has shamelessly abused the Office of the Prime Minister and brought it into disrepute. Papua New Guinea’s international reputation and credibility have been trashed. The nation cannot afford one more moment of Mr O’Neill’s Prime Ministership. A home-grown rescue plan must be developed and implemented as soon as possible, using expert and independent advice from our best talents and with the assistance of our international friends and multilateral partners. In our view, it is in the national interest to make this change.